In the previous Writing Workshop, I discussed the importance of observing and recording what you see, hear, feel and experience in order to improve your stories. I would like to expand on that idea by reviewing how you can use written resources to move your story along, improve your character’s personality, and help build the world they exist in. If you are a fiction writer, you have to invent believable characters and the places they walk through. The key word here is believable. That means you have to do your homework. This is especially true for my writer friends of historical fiction. One way authors do research is to just read a book about the country and time frame you want your story to take place in. There are tons of books and online sites you can dive into. That is all well and good if you want “flat” characters. If you want your characters and where they live to pop out at your readers, to be believable, and to touch their emotions, you have to get your hands dirty and try out some of the things they would experience so you will have first hand knowledge. That first hand knowledge is magic for your writing. Seeing it’s the month of March and we just passed St. Patrick’s Day, I am going to use the example of how a writer of a historical Irish character may find that “magic”. If one can not travel to the far away place your story is set in, such as Ireland, then think of smaller details to set the mood and scene. Find what you have in common with that place. They have beautiful rolling green pastures. Find one near you and sit in it. Feel the grass and watch how the wind moves it. Use those observations in your story. Now what if your characters are having a long conversation? Do they just stop everything and look at each other in order to chat? No. An Irishwoman in history would never had time for such nonsense. She would be having a conversation while doing something. THAT will make your character appear more real and human. So what is she doing? That is your next bit of research. There was one constant for women in history: most of their time was taken up by growing and preparing food for their families. That is your gateway into making your character believable. As she gets the needed dialogue out to make your story move forward, have her hands and body busy preparing a meal, or tending to sheep, or feeding a child. 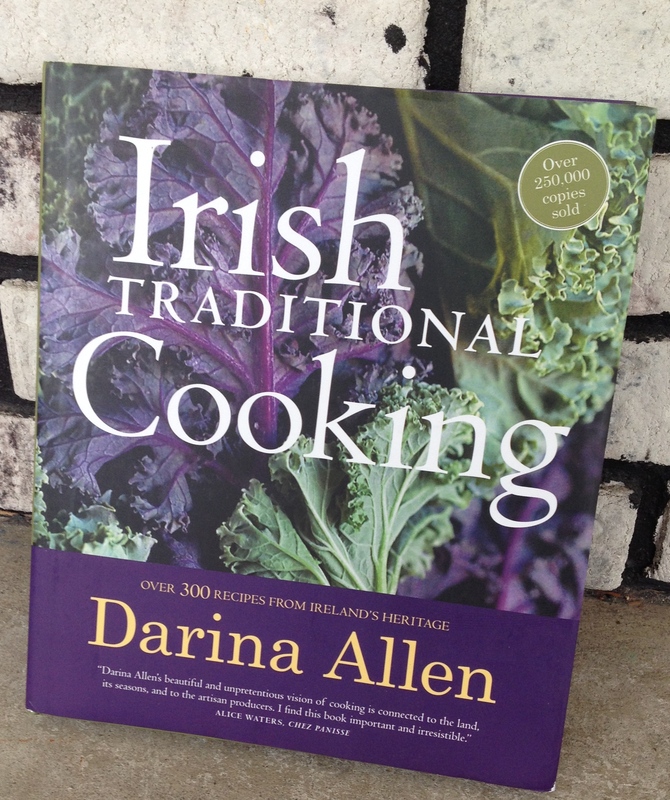 And that is where a book like Irish Traditional Cooking by Darina Allen can come into play as a source of inspiration. 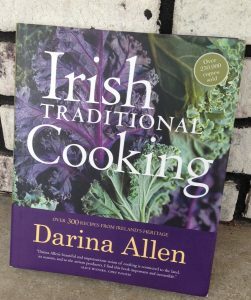 Not only will you find MANY traditional recipes, the author has stuffed the book full with carefully researched resources, first person accounts, and local cultural food practices. You will also learn the local names of the food, something very important to give your writing legitimacy. I loved the little side note about the fishermen who would overnight camp on an island and collect seabird eggs to eat-not an easy task we are told. I see seagulls everyday. I would never think to eat their eggs! The author also speaks about how you can tell a bad egg-it floats, from a fresh one-it sinks, in water. What fun that be if your character pauses in his conversation to toss out a rotten egg he just dropped into a pot of water, or maybe he intentionally feeds it to someone he doesn’t like! That was common folk wisdom to know the good from the bad, but not something everyone now a-days who brings their eggs home in a carton would know. Our characters are “alive” to us. By showing them doing normal daily activities you will make them alive to your readers. To help you with that, try the recipes in this book or from a historical document for your character’s time-frame. As you prepare it, take note of the aroma’s that might fill the room, or the texture of the dough, or the sound of a bubbling pot. Put that in your story. Bring your readers into your character’s “world” through their senses. Another part of the above book goes into detail about using forged food-something every person in history had to do. With this information, I can easily envision characters carrying on a conversation while they busy themselves collecting eggs or seaweed or berries to make their meal. Take this one step further and actually grab some field books on wild edible plants and go look for some of the plants/berries in the recipes. Note how difficult it is to find them. Feel the leaves. Are their thorns? Your character could accidentally get stabbed by one. Are they large bushes? Could your character suddenly duck down behind it to hide from the antagonist of your story? Look at the berries collected in your basket and describe them. Though I don’t suggest you actually try this-unless you happen to live on a farm, the author Darina Allen also details how to slaughter a pig and how this was a community event and every part was saved and used. Knowing about common group activities for your character’s culture, you can work that into your story as a way to bring families together and the chance to exchange gossip, ideas and to flirt! Get my drift? In summary: Yes, I agree, books and online articles can be a good first step in your research. Just remember, you are always going to run into those readers who are from the area you are writing about. They may scoff at your lack of an intimate knowledge of the place. In this day of on-line book reviews that will just not go away, that one person can kill future sales. To avoid this, work hard at building up the details of the character’s daily activities, thoughts, feelings, sensations, and actions, rather than a sweeping description of the place they are in. Those details will bring your readers deep into your story and give your characters “life”. Isn’t that what every author wants to do and every reader wants to experience? Now go out and have some fun collecting your research!